Back in 1962, when the network of ostomy support groups was first organized in the United States there was a quiet, unassuming man who was one of the pioneer leaders of this ostomy mutual aide and peer support movement. This same man was also one of the founding fathers of the International Ostomy Association. His name was Archie Vinitsky. 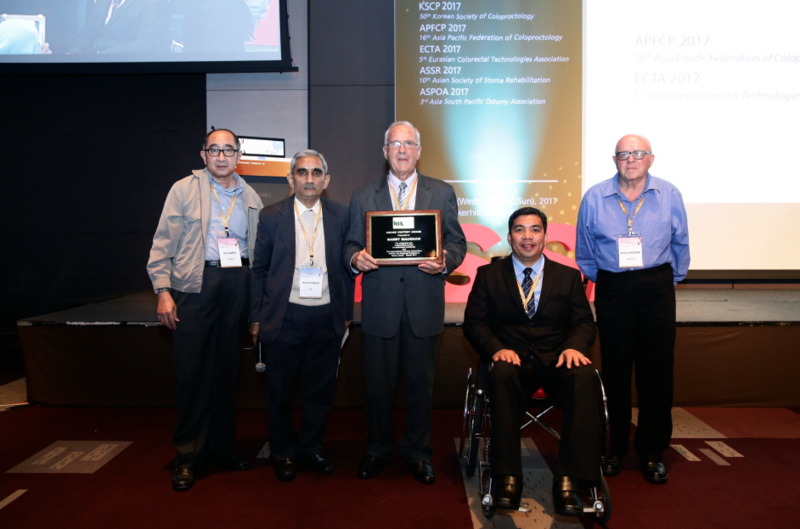 As a tribute to the achievements of Archie, IOA established an award that bears his name. This award is presented periodically to a person the worldwide community of national ostomy associations believes has done an outstanding job on their behalf. The 2017 Archie Vinitsky Award recipient is a person who shares many of Archie's characteristics. Archie was an independent thinker, a man who knew what course of action needed to be taken, and took it … our recipient is a person who is not readily dissuaded from a strongly embraced cause. This is a person who has voluntarily and freely given of his time, talents and experience to advocate for the rights of those who have undergone, or will undergo ostomy surgery. Archie was an Organization leader who accomplished great things while serving in various leadership roles at the local, regional, national and international organizational levels ... and the same holds true for today's recipient. Our recipient was found to be a most sincere and dedicated person who, like Archie, worked selflessly to improve the quality of life of ostomates, not only in his home country, but also in many developing countries of Asia, Africa and the Middle East. Archie's belief was that the strength of IOA lay in the work it undertook. Our recipient shares Archie's zeal for projects and has worked as an excellent quality team player who could be counted upon to assist in making relevant projects a reality. By using the IOA Visitor Training Program and ISCAP presentations, he was successful in the establishment of stoma support clubs in the Chinese cities of Beijing, Nanjing, Shanghai, Hangzhou and Guangzhou from 2009 to 2012. 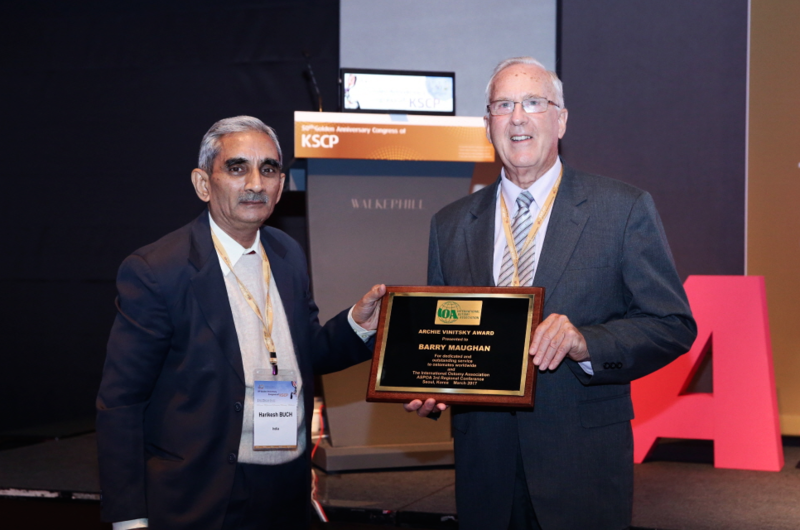 He has acted as "The Voice of IOA" by serving most effectively as liaison with other professional bodies like the Colorectal Surgeons' Association, World Council of Enterostomal Therapists, and the Lions for Stoma Care initiatives. He also enhanced partnerships with the manufacturers and distributors of ostomy prosthetic equipment. I'm sure that by now you have recognized our Award recipient, this humanitarian who has devoted a large portion of his life to help the Federation of New Zealand Ostomy Societies, the Asia South Pacific Ostomy Association and the International Ostomy Association in their missions to help ostomates around the world … help for which the worldwide community of people with bowel and urinary diversions say "THANK YOU BARRY MAUGHAN, YOU HAVE SERVED US WELL"!